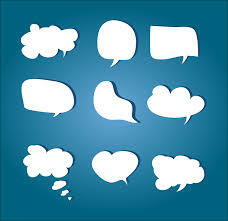 These four ways of talking all achieve different results. 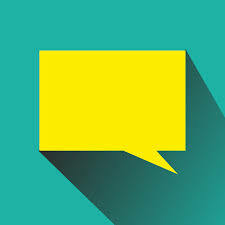 However, the authors contest that a focus on using dialogue during meetings can help people “dig deeper into ideas, become more thoughtful, listen well, recognize assumptions, and see connections.” For organizations, dialogue can help improve how people talk about ideas and can lead to more collaboration. I think it’s true that organizations do not make enough time for dialogue. The authors believe that if dialogue is implemented regularly the “resulting power shift breaks down traditional, hierarchical leadership.” I also think it’s true that organizations (and classrooms) need to find the time for genuine dialogue. A good place to start is with establishing norms for what successful dialogue looks like. 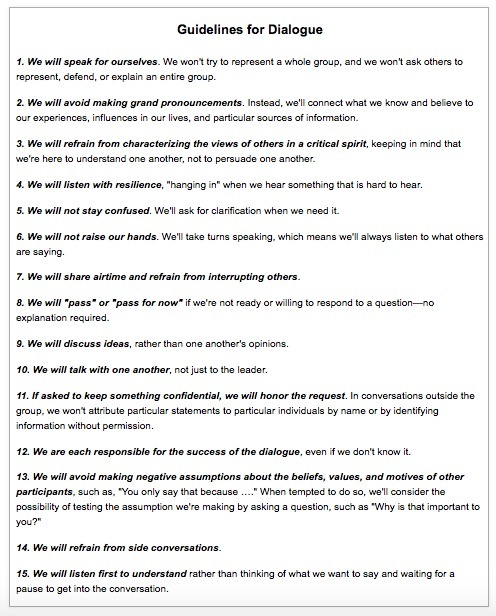 The authors include a list of fifteen rules for guiding dialogue that I’ve included below. Let’s use them to bring back dialogue! Graybill, Oscar, and Lois Brown Easton. “The Art of Dialogue.” Educational Leadership 72.7 (2015): n. pag. Web. 27 April 2015. Today’s dialogue was meaningful. I walk away from meetings where the hierarchy is non-existent feeling like a contributor. Exactly. I think you are right about the differences between contributor vs. listener. If people are forced to only listen, it immediately creates hierarchy.